There are several different models of the Resmed S9. Some are known as "bricks" because only provide summary data and not any detailed data. Please provide the exact model you have. Hi it's the s9 escape. Unfortunately you have a brick. The Escape will only report summary data. Thanks for the info I think I'm going to have to ask at the hospital ? Just reminding folks that until ResMed straightens this out, you can still download vrsion 5.9, which works fine (see quota below). (06-11-2018, 02:58 PM)SuperSleeper Wrote: This happened before when ResScan introduced a new version. I think it was version 5.0. They made it available, then all of a sudden, it dissappeared from the ResMed website. About a week later, they released version 5.1. Apparently they had some problems in the earlier-released 5.0. Hello, I get error message every time I click on link: This site can’t be reached. 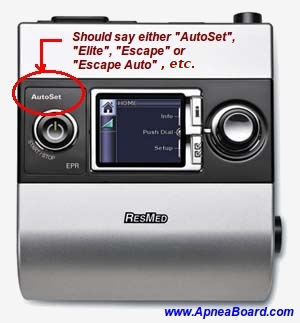 Quote: TEMPORARY NOTE: As of 6-11-2018, ResMed has removed the ResScan 6.0 installation file from their website. Please see this post on why this might be. Until they restore version 6.0 or move to version 6.1, the download link to version 5.9 still works and you can use version 5.9 with no issues. MODERATOR NOTE: I'm actively merging threads that deal with this exact same issue into this thread. (06-11-2018, 02:34 PM)knoxy381 Wrote: Hi im trying to download the ResScan software on windows 10 but the link says that it has been removed. I have a ResMed machine and am new to sleep apnea but would love to know whats on my sd card. Ive tried the sleepyhead software and it says my sd card wont give daily graph data. Any ideas anyone? would be grateful thanks.